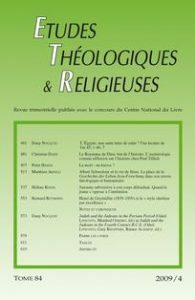 Hans Dieter BETZ, Don S. BROWNING, Bernd JANOWSKI, Eberhard JÜNGEL, éd., Religion Past and Present. Encyclopedia of Theology and Religion, vol. 1 : A-Bhu, Leiden/Boston, Brill, 2007. 27 cm. civ-719 p. ISBN 978-90-04-13980-0. € 249/$ 279.